Give yourself enough time to get organized. Decide on a theme, including colors, patterns, and props before buying your treats. 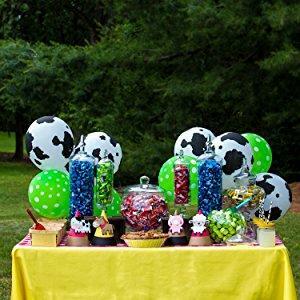 Be sure to select a variety of candy types including chocolates, marshmallows, lollipops, and baked goods. Also, a wide array of jar shapes; these are a great way to give your buffet depth. The kisses were NOT properly wrapped. Chocolate was showing on all of them. Very disappointed that it was not delivered as shown in the picture… fully wrapped ! First shipment was melted and then rehardened and all over the inside of the bag. Second replacement shipment came in good condition. Not sure whether it is a storage or sipping issue. We ordered these white hershey kisses to fill the cups for our company party…they first arrived melted together and the chocolate tasted off, we complained and were quickly issued a new order, which arrived several days later. AGAIN the bag arrived with smushed kisses and the chocolate was off, it turned white within a few days and the kisses were embarrassing to give out to our guests. We manged to salvage about 20% of the bag and use them, but within a week, the chocolate turned white, even in the kisses that were not smushed!! This is a big bag of chocolate kisses!! It arrived with the ice pack, nice and intact. Nice and fresh, nothing was melted or old. Ordered for a bridal shower and will order again for future events like the wedding, holidays, birthdays! What a waste of money! I can’t even use more than half of the bag! Cracked opened and nasty looking. So disappointed. Was going to be using them for my daughter’s first birthday party favors. Now I wasted money on something I can’t use. I work alone for half the day and it’s too quiet and boring. The solution? A giant bowl of candy! Now everyone comes by to grab a piece and I force them to talk to me. They get candy, I get conversation, everyone is happy. Since it’s a law enforcement facility, they really like the blue wrappers. This bag is huge and the candies were fresh and wrapped properly (unlike some of the other bulk bags on here). Very satisfied with the purchase. Will buy again. About 400 came in my pack. I had 100 little favor boxes and I was able to place 4 kisses per box. Clever shipping in a refrigerated bag! Further, these are the freshest hershey’s kisses I’ve ever had. What a difference from the ones bought at the store. They will be beautiful in the little acrylic blocks I bought for girl baby shower favors. The rest will be scattered in the middle of the tables for extra pink decoration. This was a good buy. I ordered these to use in my wedding favors, and while the kisses are still delicious and the package was the size I needed, they didn’t actually come with almonds. They are just regular kisses in gold foil. I am little disappointed by this as I bought regular kisses as well and was going for some variety. Oh well, I guess. No big deal, but beware: if you’re looking for almonds, you might not getting any. Every table had a candy dish full of kisses and these were the extras placed on game winner prize table. They were great! I mixed these with the more expensive “it’s a girl “ kisses. They actually have the same color foil anyway.